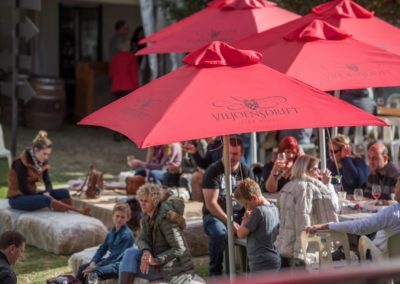 Viljoensdrift nestled south of the Elandsberg Mountains, on the banks the Breede River, the lifeblood of the Robertson Wine Valley, is home to the Viljoen family whose heritage of winemaking dates back to 1818 when their French Huguenot forefathers first planted vines. 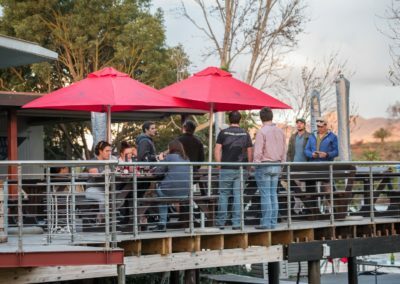 Today brothers Fred and Manie Viljoen continue this proud tradition and, after humble beginnings in 1998, they are producing award-winning wines with global appeal. 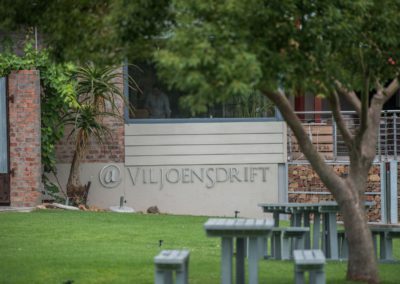 Viljoensdrift’s success can be attributed to their pioneering spirit, the quality of teamwork from vineyard to cellar and their deep-rooted commitment to working in harmony with nature. 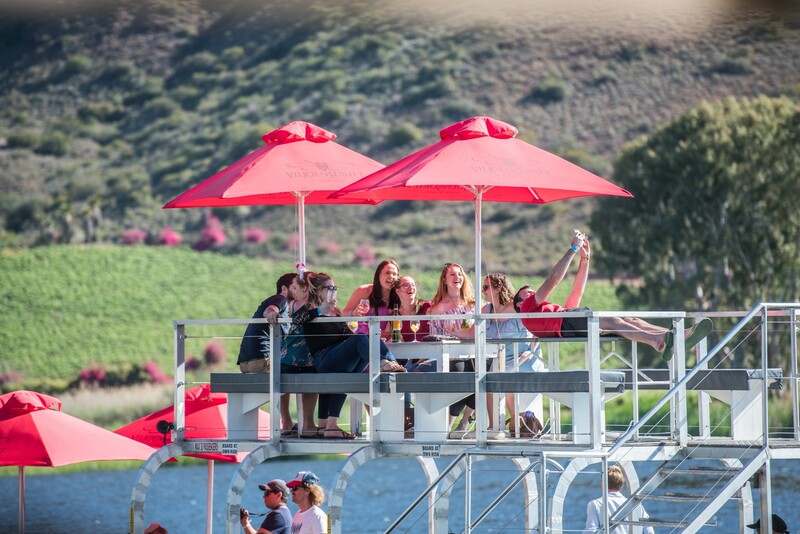 Five generations of Viljoens have lovingly toiled the fertile deep alluvial, calciferous-rich soils fed by the life-giving Breede River which allow the vineyards to flourish. 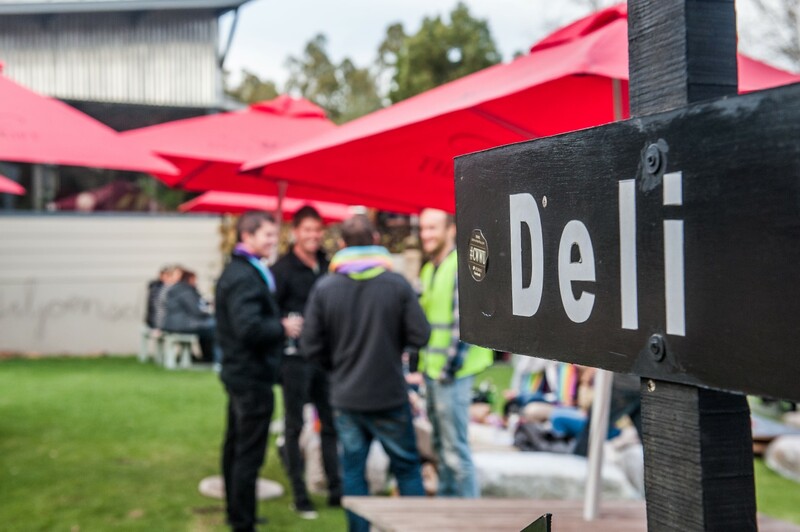 The terroir lends itself exceptionally well to the growing of noble varietals such as Shiraz, Pinotage and Chardonnay. 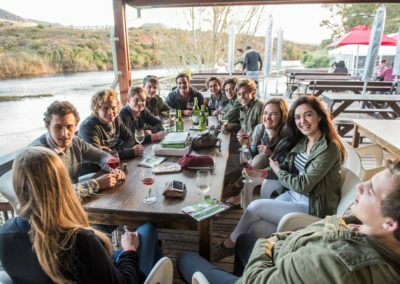 Wine tourists can expect much more from Viljoensdrift than just a taste of their distinctive wines. 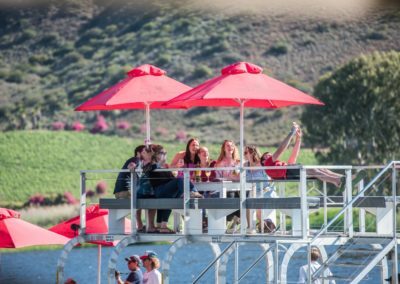 A visit to this peaceful haven, a mere 90 minutes from Cape Town, also promises an inspirational riverside experience including a relaxing boat trip on the tranquil waters of the Breede River, a taste adventure from the deli and a gourmet picnic on the banks of the river. 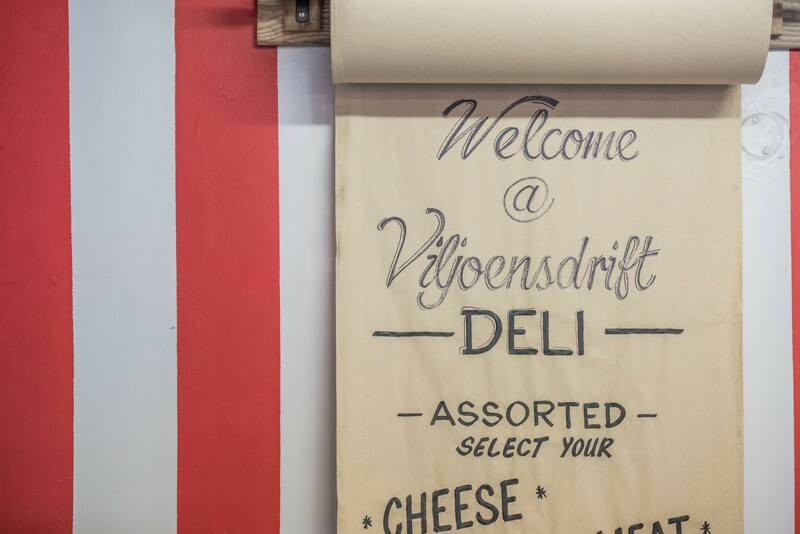 Viljoensdrift is a family owned farm and winery with brothers Fred and Manie Viljoen at the helm. 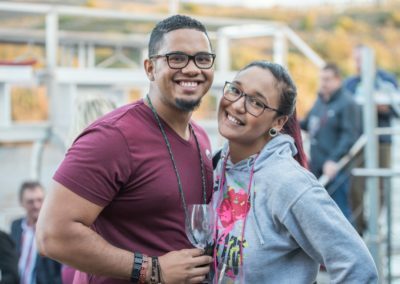 Manie, as viticulturist, manages the vines and deciduous fruit, while Fred works his magic in the cellar. 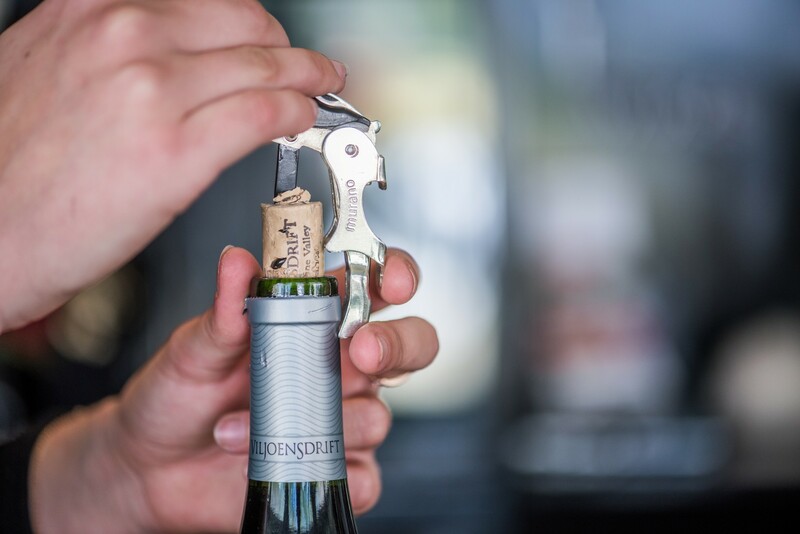 In 1998 Fred and Manie opened the cellar door after 30 years of supplying grapes to the local co-op and now they are reaping the benefits of their commitment to and passion for wine making. 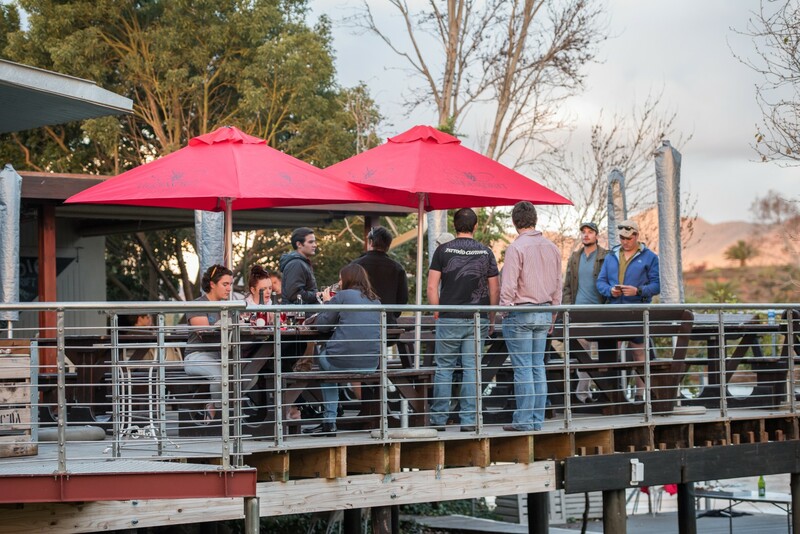 They have since then re-aligned Viljoensdrift’s focus to own label production and has entered the market place, locally and internationally with resounding success. 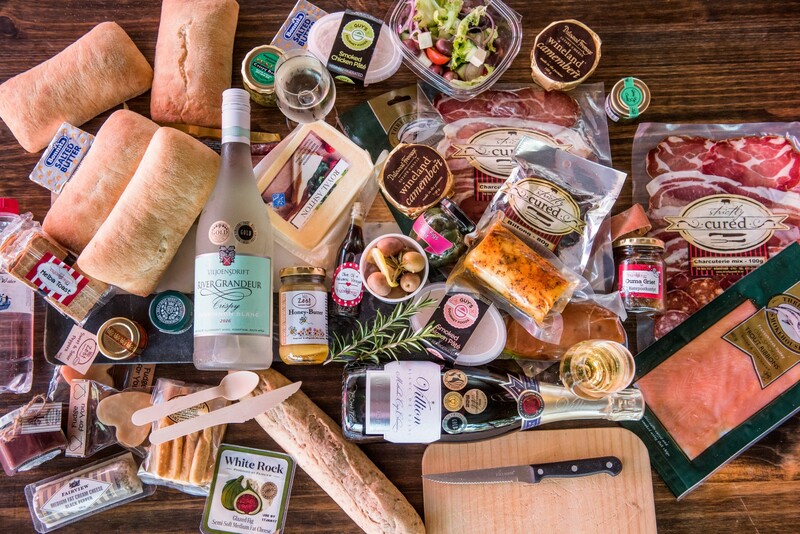 Besides crafting exquisite wines on the farm, a significant amount of energy goes into their fruit production operation, with apricots and peaches grown mainly for canning purposes. The extended farm family includes Farm Manager: Danie Slabbert, Financial Manager: Lindie Viljoen, Assistant Winemaker: Zonia Lategan, Secretary: Sharon Pretorius, Assistant Financial Manager: Ashley Carolus, Restaurant Manager: Jackie Hill and 46 dedicated and well-looked after farm labourers. The first generation Viljoens, or Villion as these French Huguenots were called, planted vines for wine and brandy making way back in 1818. They distilled the then well known Cape Smoke Brandy and produced hanepoot and muscadel sweet wines, using raw brandy for fortification. Many a cold winter’s evening was made more enjoyable by drinking a “sopie” (sip) of this wonder of the earth that was produced with such vigour and enthusiasm. 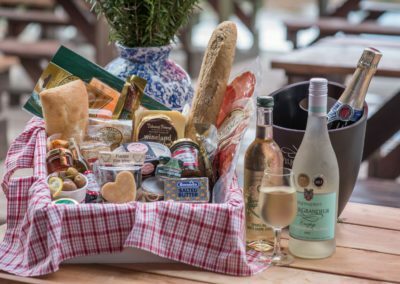 Five generations after the farm was established in 1863, that ground-breaking spirit remains, while the sense of tradition and passion for the grape runs as strong as ever. 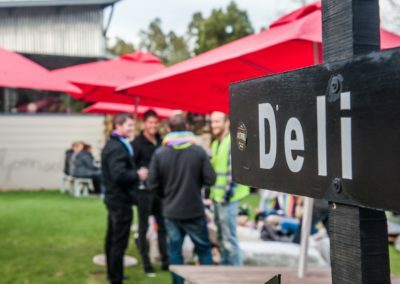 In 1998 Fred and Manie’s dad Ben stepped down and after 30 years of delivering their grapes to the co-op, the brothers bravely opened the cellar door to produce their own wines from the high quality grapes the farm brings forth. The conservation of their unique environment is an integral part of the farming philosophy of the Viljoens. 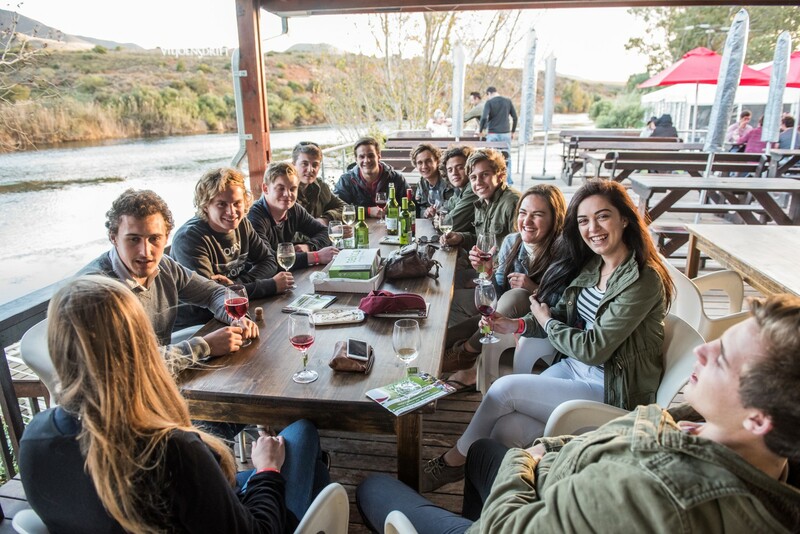 A young Fred studied Nature Conservation at the Cape Technikon and today, armed with knowledge and passion, the conservation of Viljoensdrift’s natural habitats runs like a golden thread throughout their farming and winemaking operation. 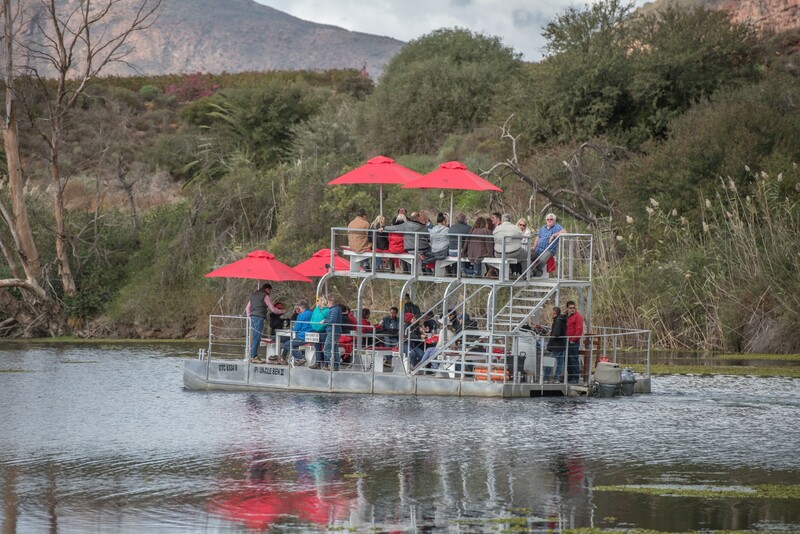 The farm straddles the Breede River and although most of the riparian areas along this river have been transformed for agricultural purposes, a pristine section of indigenous vegetation can still be found here. 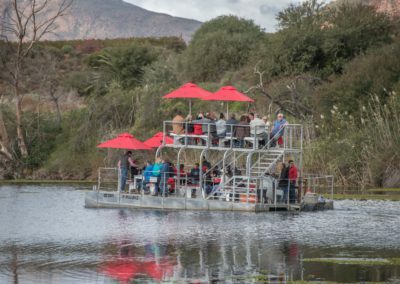 The Viljoens treasure this area where beautiful old Breede River Yellowwood, Wild Olive and White Olien trees create an excellent habitat for various water birds, including the awe-inspiring Fish Eagle. 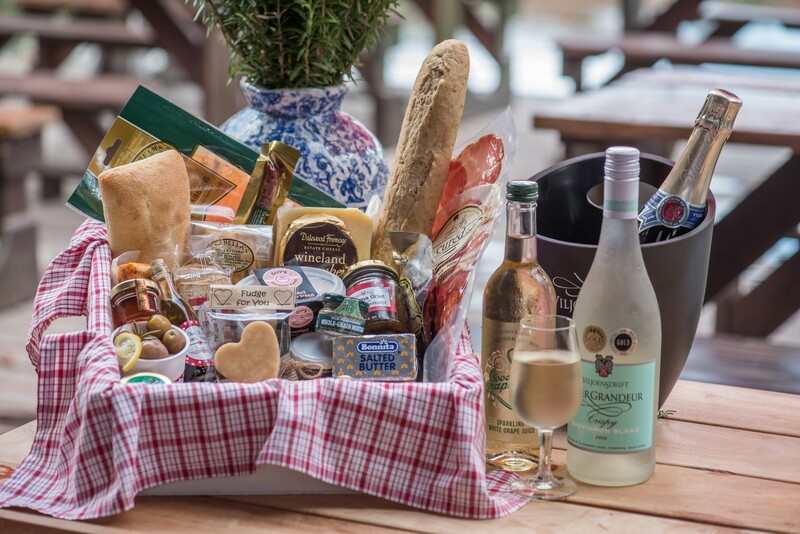 Their commitment to the Biodiversity and Wine Initiative, which aims to minimise the loss of threatened natural habitat and to contribute to sustainable wine production, rings true. For the Viljoens this means actively incorporating sound natural resource management practices on literally every level of their interaction with nature. A long-term action plan for the management of alien vegetation – mostly Port Jacksons, Wild Tobacco trees and Blue Gums – directs and prioritises their alien clearing efforts. A continuous bird survey has produced a specie list of 50 birds, while plant, fish and animal surveys are also on the cards for the near future. Their conservation aims further include a concerted effort to saving water, wastewater management, recycling and the curbed use of chemicals. 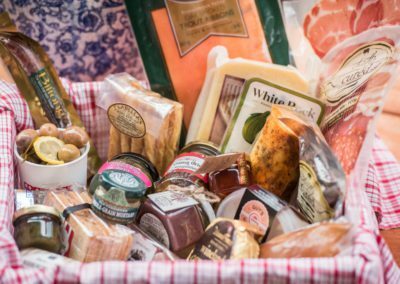 “We do not favour using chemicals, but when we have to we only use those accepted by the South African wine industry,” says Fred. 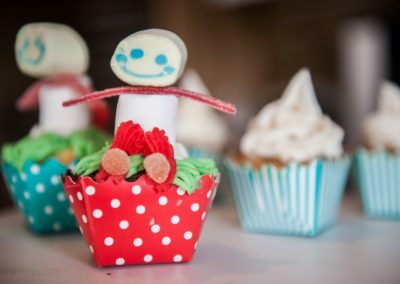 The adjacent Renosterveld also forms part of their 50 ha conservation area and creates an excellent buffer zone between the indigenous river habitat and their agricultural activities. 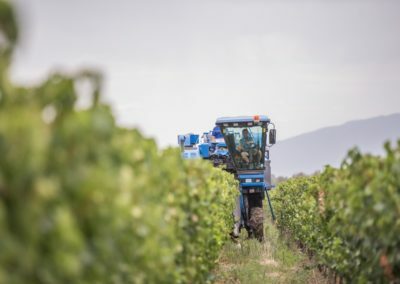 They have also embraced the environmentally friendly Integrated Production of Wine (IPW) scheme whereby Fred and Manie undertake to grow grapes and make wine in an as environmentally friendly manner as possible. 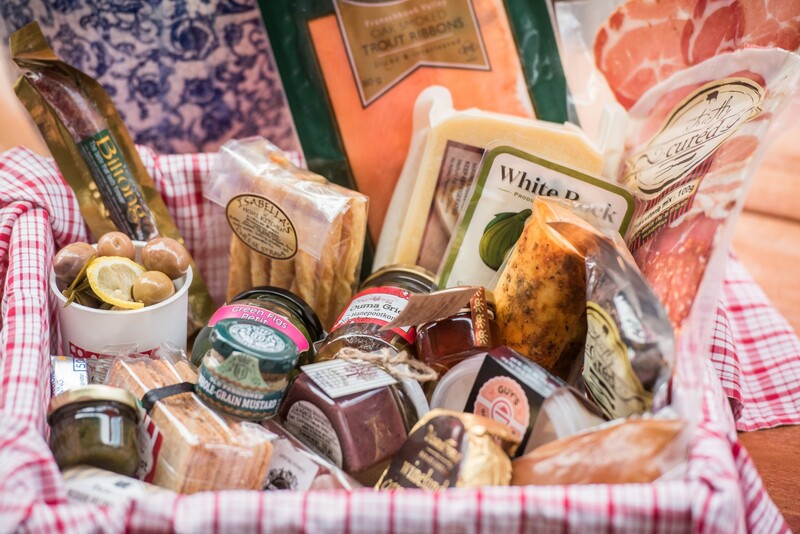 The IPW scheme is unique in that it is inclusive of all facets, from the preparation of the soil, through all production processes. 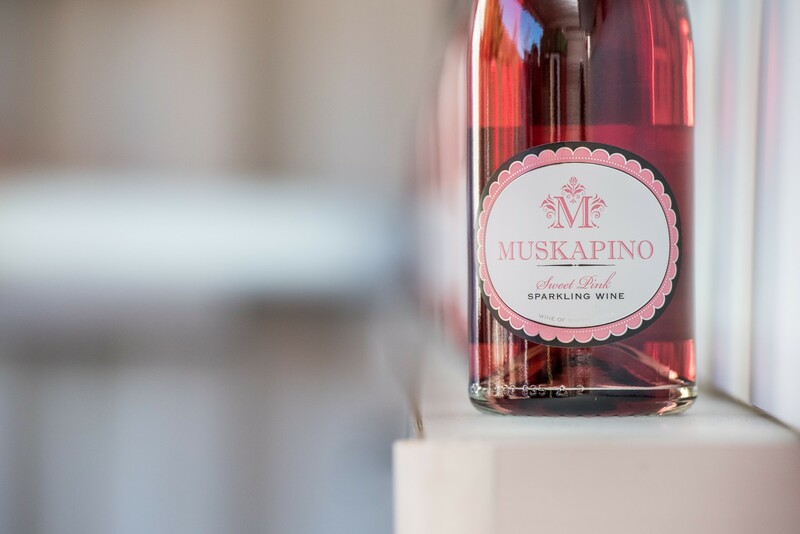 Meticulous vineyard and cellar management practices play a pivotal role in their success. 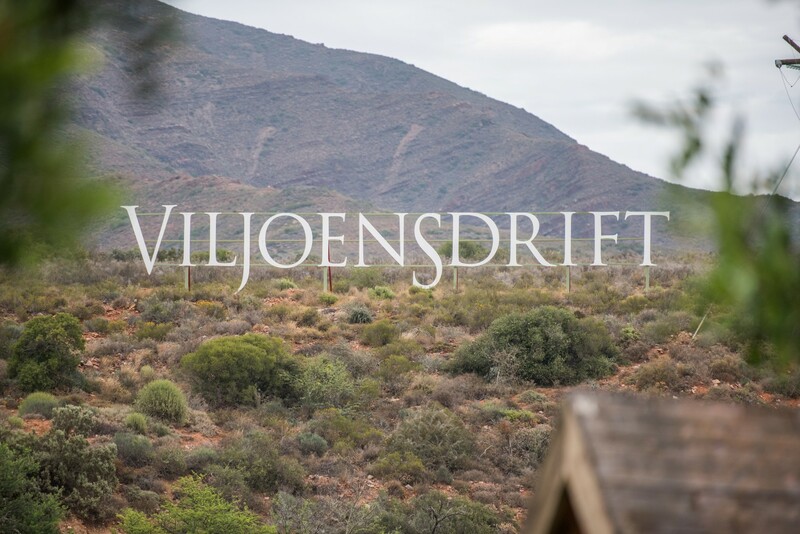 Viljoensdrift’s wide variety of soil types, including deep alluvial, calciferous-rich soils, enables them to establish the right cultivar on the right soil to ensure top quality wines. 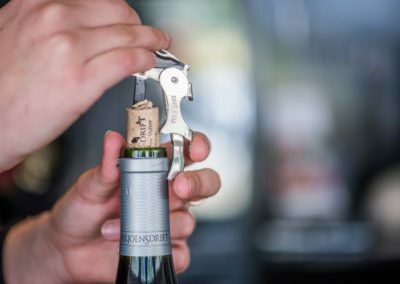 The red-white cultivar ratio sees a 50/50 split, with Shiraz leading the way in area under vines, followed by Pinotage and Merlot. 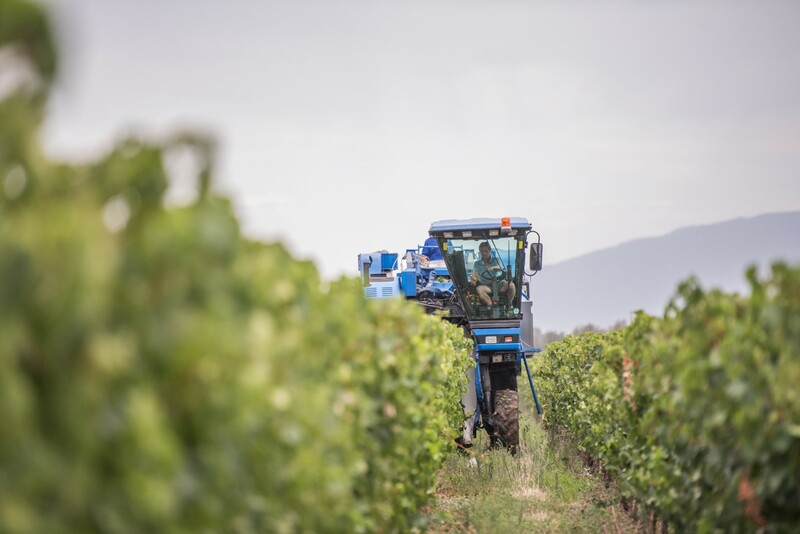 During the course of 2009 another 4 hectares of Merlot were planted, bringing the total for this variety to 9.3 hectares while the first 2 hectares of Cabernet Franc have taken root. 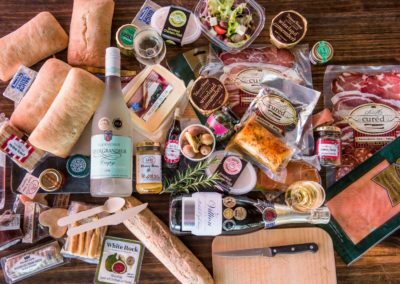 Two hectares each of spicy French Petit Verdot and Portuguese Tinta Barocca will further diversify the estate’s portfolio which also includes Chardonnay, Sauvignon Blanc, White Muscadel, Colombar and Sémillon. In the state-of-the-art cellar ultra-modern stainless steel tanks share the limelight with traditional open cement tanks – an old-new partnership that yields outstanding wines that meet with stringent international standards. A special small wood maturation cellar houses up to 300 oak barrels for those wines earmarked for wood maturation. 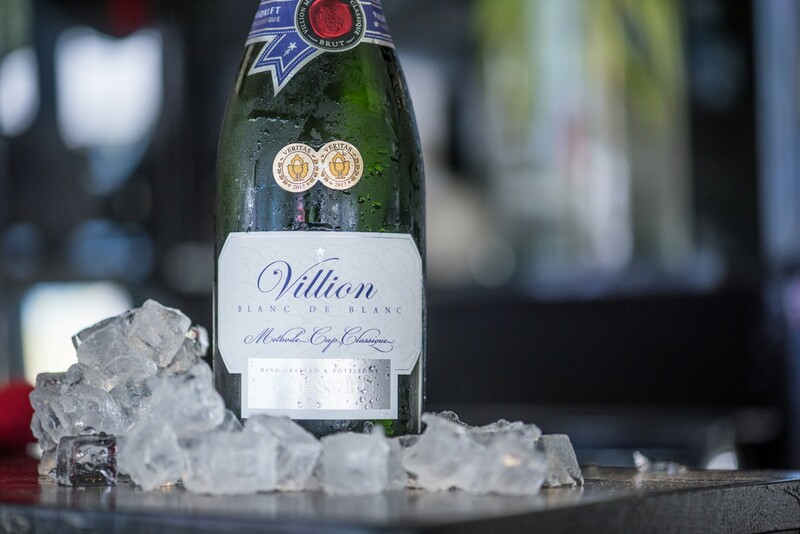 On 23 January 1998 the first grapes were removed from the stalks and crushed, heralding the start of a new era for the Viljoen family. 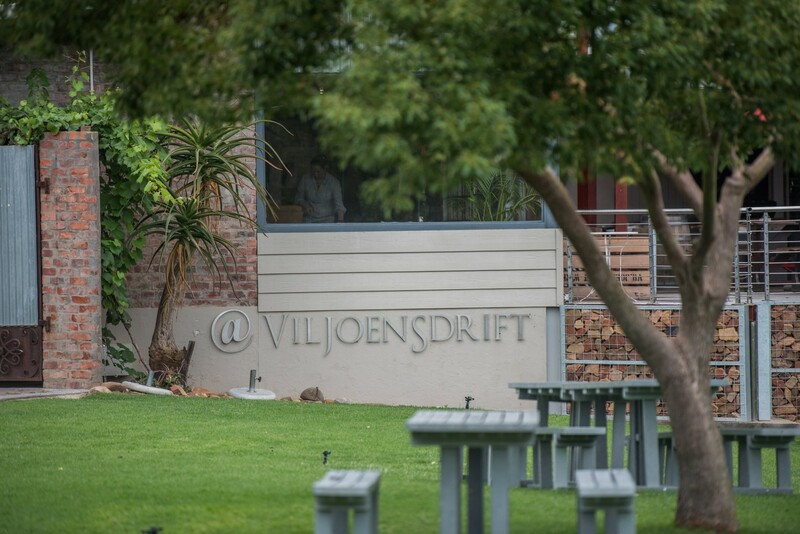 As a result of the brothers’ sheer passion for and dedication to the family’s winemaking tradition, augmented by a shared determination to create quality wines from the superb grapes produced on the farm, Viljoensdrift’s wines compare with the best in the world. Numerous awards garnered at several highly regarded local and international wine competitions bear testimony to the success of their winemaking philosophy. 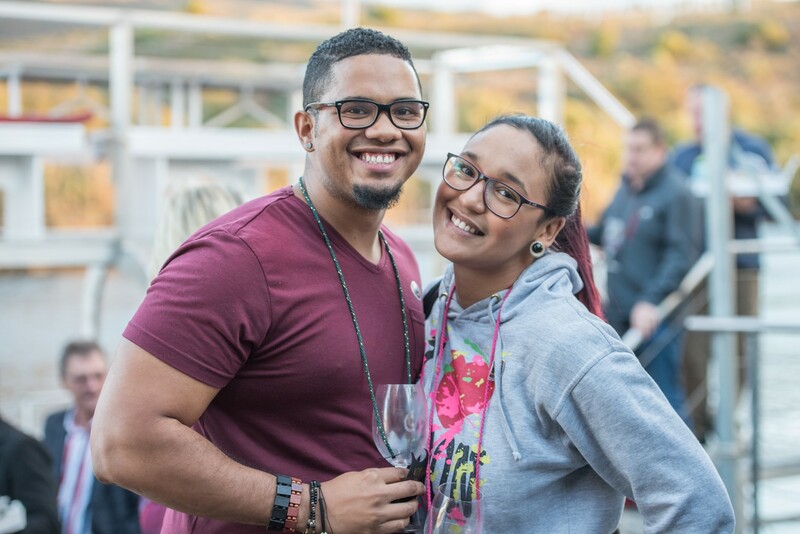 The dynamic duo behind Viljoensdrift wines keeps abreast of developments and continues to stay in touch with the demands of the market – both locally and internationally. 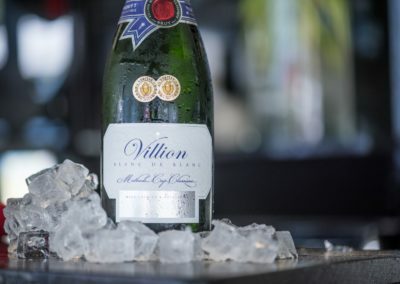 Their wine portfolio offers a diverse yet complimentary combination of red and white, including the Cellarmaster’s Selection, limited-edition wines produced with extra care in small volumes which is winemaker Fred Viljoen’s pride and joy; and the Villion Méthode Cap Classique which pays homage to their French roots. 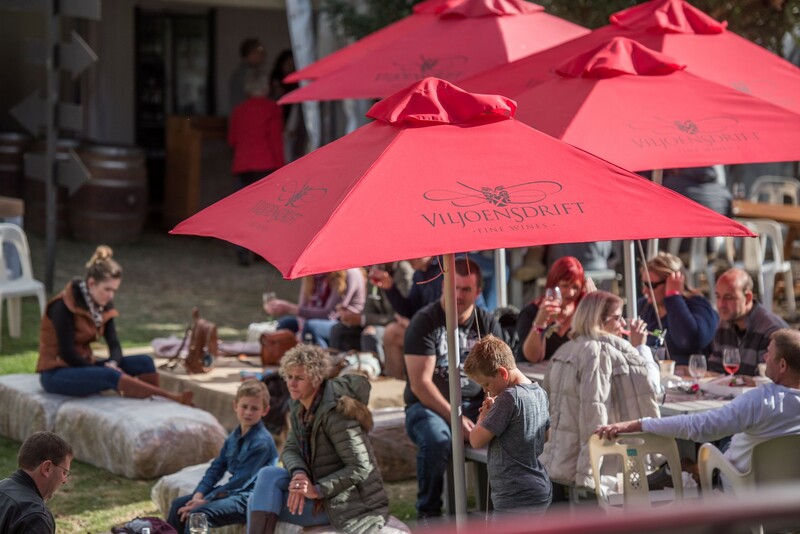 The Viljoensdrift range of value-for money carefree quaffers comprises a duo of Anchor Drift blends – one white and one red. 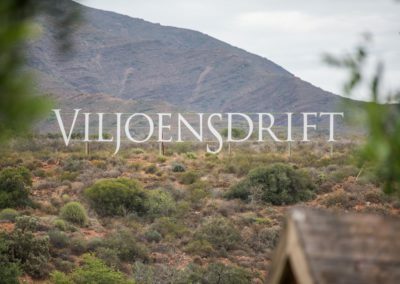 This special selection of wines, from carefully tended vineyards, bears testimony to the dedication, passion and pioneering spirit of the Viljoensdrift team. 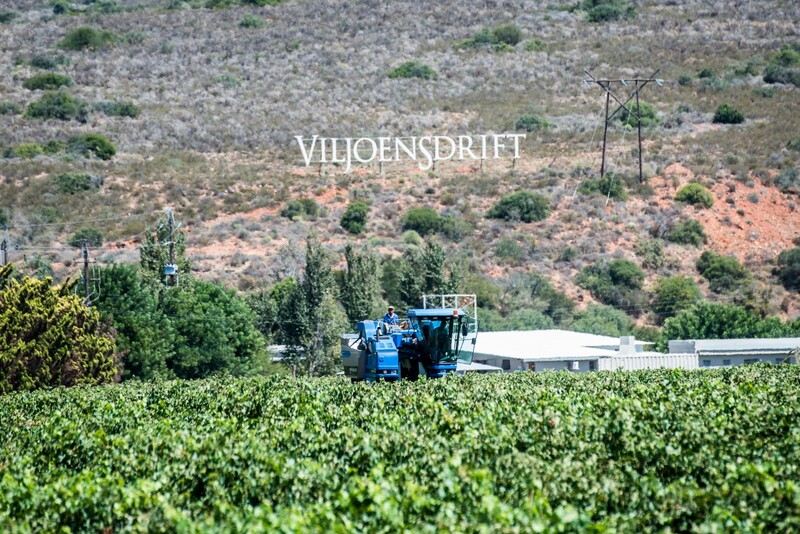 Viljoensdrift is currently busy doing green harvesting in their Pinotage vineyards. Due to good weather and vineyard practises , Manie , viticultirst and co-owner of Viljoensdrift did the calculations by counting the bunches and came out to a total of 30 tons per hectare! Far too much for quality Pinotage of course. By throwing off bunches from underdeveloped shoots as well as underdeveloped bunches of green grapes , he looks at a production of between 6 and 8 tons per hectare which will assure quality.Much more concentration and even ripeness will be achieved.During the ripening period , more uneven ripening bunches will be thrown off.For a family business to survive in such a competitive wine business , strict rules have to be followed, although it is not easy to look at the grapes lying sunburned on the ground. 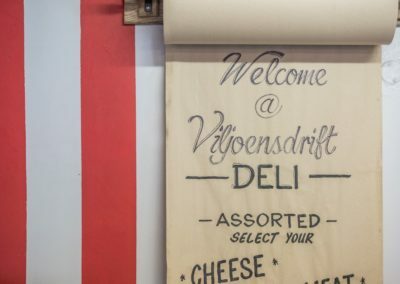 Looking at the photo’s , before and after , it surely shows the incredible effort that Viljoensdrift undertakes to assure quality. 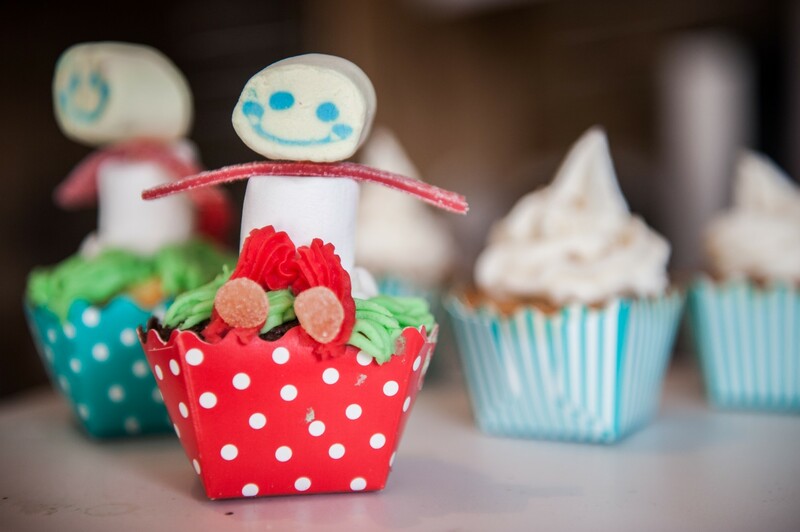 The photo’s will surely speak for themselves. 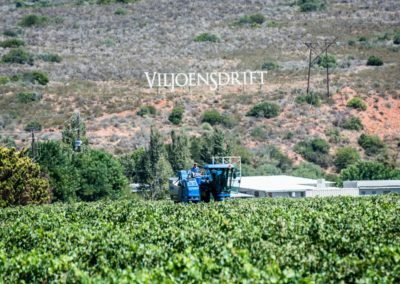 “To see grapes lying underneath the vines on the soil , is a sure sign of dedication , sustainability and an ever existing urge to make the ultimate wine” , says Fred , winemaker of Viljoensdrift. 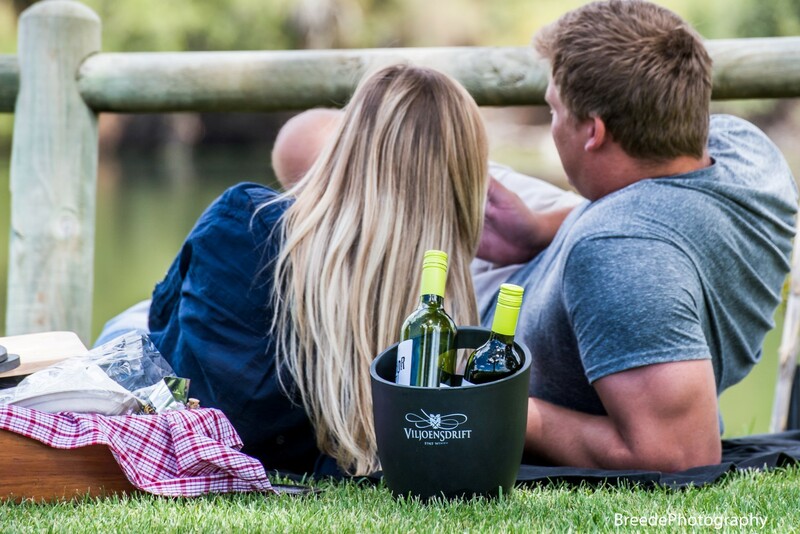 This specific Pinotage vineyard is situated on the southern side of the Breederiver , opposite the wine tasting facility. The soil type is red karoo scale with plenty of rocks as shown in the photo , ideal for Pinotage.